I was deeply disturbed by the recent theater shooting in Aurora, Colorado and have closely followed the story. As a parent, I’m most affected by the fact that a 4-month-old baby was injured and a 6-year-old girl was killed. I can only imagine the thoughts and emotions of their families. But I’ve had many other reactions as well. I am disturbed by those who suggest that the movie theater attendees were insufficiently armed and brave enough to prevent the tragedy. As Slate points out, the suspect was heavily armored. Given the speed of the attack, the fact he started with a gas canister, and that the theater was darkened and quickly became a chaotic scene, I feel certain that anyone who tried to shoot back would have been likely to injure or kill innocent bystanders. Inevitably, we’re now on the topic of guns and gun control. While I personally do not wish to own a firearm, I have many friends who feel strongly on the matter, and over time I’ve become convinced that outright prohibition is no solution, and that any gun control measures should be minimal and extremely well-considered. As a moderate on this issue, I despise the polarization of the debate. Most on the left seem to feel that the only acceptable solution is to completely ban all firearms. And on the right, the default seems to be the NRA’s apparent position of absolutely zero gun control legislation, no matter how reasonable or effective, under any circumstance. The Second Amendment to the Constitution exists. Guns aren’t going away. Hunters will hunt, and those who are hobbyists or gun enthusiasts have the right to bear arms. While I feel the data on keeping a gun (or guns) in the home for self-defense has far greater risks than benefits, I don’t deny the right of a person to keep a gun for self-defense (and, in fact, one third of American households do have a gun in the home). So we clearly aren’t going to ban guns. On the other extreme, despite the Second Amendment, there are going to be laws, and we need them. Every state in the U.S. has some form of limit on the purchase, possession and use of guns. So, just as we agree guns will exist, we also agree gun laws will exist: I don’t think anyone would argue that, say, a criminally-insane 13-year-old should be allowed to purchase a gun whenever desired without any restriction. So, as with every issue, it’s about where we set the line. The Second Amendment isn’t commonly interpreted to mean that individuals should be allowed to own tanks, or nuclear weapons, or instruments of biological warfare. So clearly there are limits. I believe it’s reasonable to argue that certain types of guns, including the assault rifle with the 100-round magazine used by James Holmes in Aurora, should be prohibited for sale and possession. Perhaps waiting periods need to be beefed up as well. However, none of that seems like it would have prevented the tragedy here. All of this is actually preamble to my main point: I think it’s rational for there to be a certain amount of fear after an event like this. 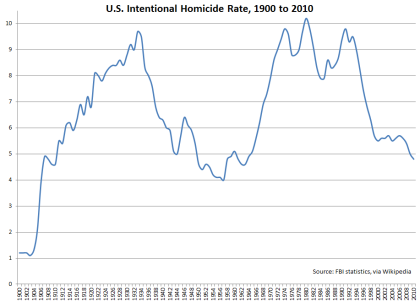 But it’s also important to keep in mind that, statistically, we in the U.S. are all at less risk of being murdered today than at any point in the last 46 years. 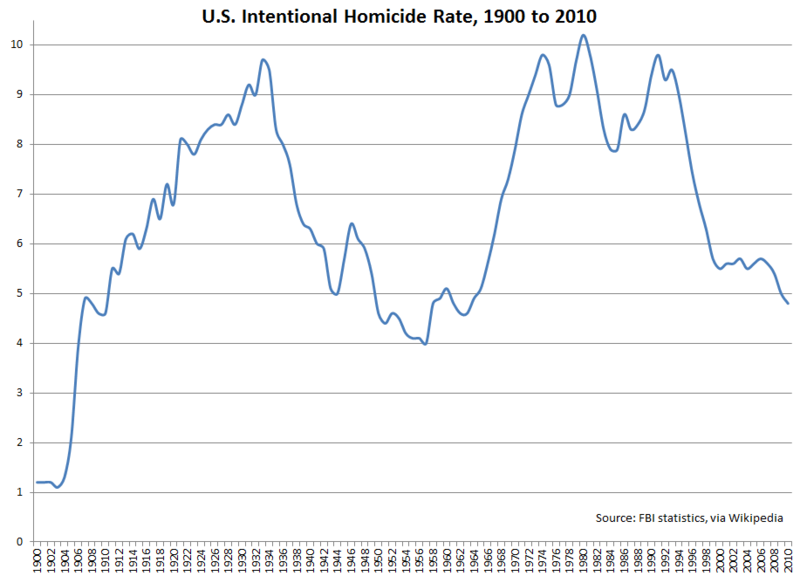 The “intentional homicide rate” (basically, the murder rate) in the U.S. is 4.8 in 2010, per FBI data compiled and displayed at Wikipedia. That means that in 2010, per every 100,000 people living in the United States, 4.8 were murdered. It’s easy to let media reports influence our thinking and panic us. Fear-mongering is a big part of mainstream media activity today, and I feel it’s mostly done in order to garner eyeballs. But the fact is, the murder rate is headed down. Events like the one in Aurora are a tragic aberration. This entry was posted by Stephen on Tuesday, July 24th, 2012 at 1:06 pm	and is filed under news, politics, thoughts. You can follow any responses to this entry through the RSS 2.0 feed. You can leave a response, or trackback from your own site. I’ve been reading elsewhere that there is a correlation between gun violence and a) prohibition, and b) the war on drugs.